St. Petersburg is unquestionably a Highlight of Baltic and Northern Europe cruises that visit St. Petersburg. So every cruise passenger wants to make the most of his time in a city of the Czars. To make it happen, we are offering here samples of the most popular programs that Intours Corp. designed for our customers. 9 am: Pick up from the ship, with English-speaking guide /by a chauffeured car. Travel outside of St. Petersburg to suburban town of Pushkin to visit the exquisite Catherine's Palace with its famous Amber Room. After Pushkin leave for Peterhof, the sumptuous Imperial estate, on the Gulf of Finland, to visit the Grand Palace and beautifully landscaped park studded with pavilions, gilded statues and fountains. The most impressive out of all being the Grand Cascade. in the morning you are picked up from the ship with your English-speaking guide, by a chauffeured car. Sightseeing today includes City Highlights tour. A panoramic city tour with flexible touring, stopovers at key points of interest, and personalized attention. A visit inside Peter-and-Paul Fortress, the birthplace of St. Petersburg and its historical nucleus, the last resting place for Russia's emperors and czarinas. A guided tour of the Hermitage Museum featuring the State Rooms of the Hermitage Museum, the Old Masters of West European art collection, and French Impressionists. Return to the ship no later than 1 hour prior to cruise departure from St Petersburg. Package price varies by the size of a party. 9 am: Pick up from the ship, with English-speaking guide /by a chauffeured car. The guide is holding the sign with your names on it. Sightseeing today starts with a City Highlights tour. A 3-hour panoramic city tour with flexible touring, stopovers at key points of interest, and personalized attention. In the afternoon, leave St. Petersburg for Peterhof, the sumptuous Imperial estate on the Gulf of Finland, to visit the Grand Palace and beautifully landscaped park studded with pavilions, gilded statues and fountains. The most impressive being the Grand Cascade. Transortation to Peterhof is by hydrofoil that starts off from Neva River embankment, right next to Hermitage building. Your first look at Peterhof grounds will happen as you approach the grounds from the water, just like Peter the Great did when he approached his 'Window into Europe' for the first time. Visit inside the Grand Palace, marvel the Cascade of fountains, stroll through the Lower park to view bronze statues, many smaller fountains and pavilions. Return to the city by car. Drop off at the pier at approx. 5 pm. 9 am: pick up from the ship, with English-speaking guide, by a chauffeured car. Start off your second day in glorious St. Petersburg with a trip to the suburban town of Pushkin to visit the exquisite Catherine’s Palace with its famous Amber Room. After sightseeing, return to St. Petersburg by car. Next, a visit inside Peter-and-Paul Fortress, the birthplace of St. Petersburg and its historical nucleus, the last resting place for Russia's emperors and czarinas. A guided tour of the Hermitage Museum featuring the State Rooms of the Winter Palace, Old Masters of the West European art collection, and the French Impressionists. This is just an overview of selected must-see halls of this enormous treasure trove of world art. Otherwise, you would need to return and spend days, if not weeks, to see the whole of it. A City sightseeing tour will take you through city's most noteworthy landmarks from both sides of the Neva river including Nevsky Prospect, beautiful views of St. Isaac's Cathedral, Admiralty, Smolny Convent, the Statue to the Bronze Horseman, Winter Palace with its historical Palace Square, Mariinsky theatre, Menshikov Palace, canals and embankments of Venice of the North. As a special feature, you will visit inside two sights of great cultural value: the Church on the Spilled Blood with its magnificent mosaics, and Peter-and-Paul Fortress, a birthplace of St. Petersburg and the resting place of Russia's Emperors and czarinas. Today you will also visit the Grand Maket Russia Interactive Museum, a new scale model of Russia. 9 am: pick up from the ship, with English-speaking guide / by car. Your guide takes you for an overview tour of the Hermitage Museum. As a special feature included is a tour of the Gold Room, part of Hermitage's Hidden Treasures Galleries. In the afternoon, visit the Russian Museum, the largest depository (over 400,000 exhibits) of Russian fine art, and the leading restoration centre, located in world-class Mikhailovsky Palace. Travel 25 km south of St. Petersburg to Pushkin to visit exquisite Catherine's Palace with its famous Amber Room. As a Special arrangement, visit the Amber Room Workshop, meet the staff, learn Amber-cutting techniques and participate in the Master class. Today also visit another Imperial residence, at Peterhof, on the Gulf of Finland. The Summer residence was designed by Peter the Great to rival French Versailles. Included a visit inside the Grand Palace, view the Cascade of Fountains, walk through beautifully landscaped Lower Park with bronze statues, pavilions and fountains. A feast for tourist eyes! 10 -10.30 am: After clearing passport formalities, you will be met by your local English-speaking guide (transportation by a chauffeured car/van) for a full day private sightseeing of St. Petersburg. Your City sightseeing will feature the most noteworthy sites of this elegant city including the beautiful views of the Winter Palace, the Admiralty, St. Isaac’s Cathedral, Palace Square, the Statue of the Bronze Horseman, Mariinsky Theatre, the fashionable Nevsky Prospect, a network of canals and waterways, grand palaces, noble mansions and more. Start at the Strelka, or spit end of Vasilevsky Island, the largest island in the Neva Delta and the heart of Peter the Great ’s administrative center. At the tip of the Strelka are the Rostral Columns – 19th c. lighthouses – and an impressive view of the palace lining the Neva. You will also view the spectacular Church of the Savior on Spilled Blood, a postcard icon for St. Petersburg. Czar Alexander III built the church in 1907 in honor of his father who was assassinated on the site. Its roof line of colorful onion domes references St. Basil’s Cathedral in Moscow. Continue on with a visit inside city’s historical nucleus, the Peter-&-Paul Fortress. The oldest building of St. Petersburg, the fortress sits on its own small island in the Neva River. Within its star-shaped walls are a number of structures from the early 1700s, including the Cathedral of St. Peter and Paul, whose 400-foot-high golden spire is one of the city’s most recognizable landmarks. The Cathedral contains the tombs of Russian Emperors starting with Peter the Great. Catherine the Great is also buried here. The remains of the last czar of Russia and the last of Romanov dynasty, Nicholas II, and his family were reburied here during the years of perestroika. Today you will also be touring the world famous Hermitage Museum. Started by Catherine the Great as a private art collection, the Hermitage grew into a world class museum. It is easily comparable to the Louvre or the British Museum in the wealth and diversity of its holdings. The Hermitage houses a staggeringly varied and a fascinating collection of Western European art. The enormous collection almost amounts to a history of Western European art, from the pottery of Upper Egypt to the jewelry of Bronze Age civilizations and a full range of artists such as Leonardo da Vinci, Raphael, Rembrandt, Rubens, Picasso and Matisse, and schools including the Florentine and Venetian Renaissance, impressionism and post-impressionism. The collection of Spanish art may be compared only with that in Prado Museum in Madrid. And the collection of French art is the largest outside France, displaying works by Degas, Renoir, Cezanne, Monet, Van Gogh, Goguen and Matisse. The wealth of the collection itself is limitless – as much as you see in the museums, there is about 20 times more in its vaults. Some famed Faberge jewels, for example, are only on display during certain temporary exhibitions. This option includes a panoramic City tour of St. Petersburg, - as in Option I, - but now combined (instead of the Hermitage Museum) with a trip outside of St. Petersburg to Peterhof, the splendid Summer Palace of Peter the Great, on the Gulf of Finland. Peterhof was built by Peter the Great to rival Versailles. With its vast vista of landscaped gardens, fountains & statuary, it surpasses the beauty of Versailles that served as an inspiration for Peter the Great. Petrodvorets is the great summer estate and the artistic gem of Peter the Great, where a highlight is the delightful sequence of 37 gilded bronze sculptures, 64 fountains and 142 water jets known as the Grand Cascade. 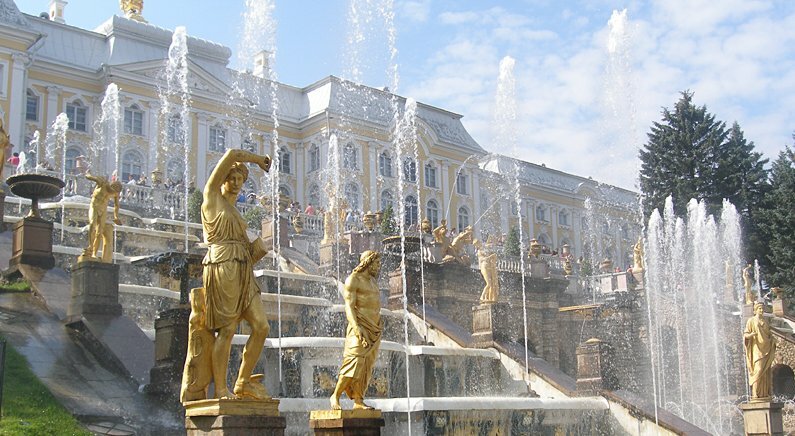 Hence Peterhof’s second name, the Capital of Fountains. Sightseeing program is provided based on Visa-Free status for the duration of services. All the sites and destinations listed will be visited inside, be seen during an exterior photo stop, or seen in passing. Due to museums, palaces or other sites being closed on alternate days throughout the week, the order in which they are visited is subject to change.